I’m not entirely sure how Ukip’s latest sugar-daddy, Alan Bown, has chosen the constituencies in which he’s commissioned polls, but they were presumably picked because they’re easily portrayed as precisely the sort of seats the Tories need to hold on to if they’re to have any chance of remaining in power after the next general election. As such, the results – even if we remember that smaller sample sizes mean higher margins of error – pack quite a punch, at least at first glance. 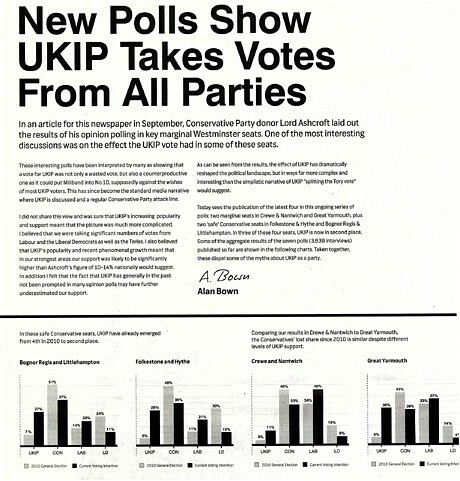 The main message of the latest round of polling, summed up nicely in Mr Bown’s Telegraph advert yesterday (see below), looks clear enough: Ukip is coming soon to a town near you and is on course to do some serious damage to the Conservatives in 2015. And that’s not all. Apparently, Ukip is also stealing support not just from disillusioned Tories but from voters for all parties and none. Adding the scores from different constituency polls together suggests that over two thirds of those saying they would vote Ukip either backed someone other than Mr Cameron’s party in 2010 or else didn’t bother to vote at all. Even worse, it looks as if warning them they could end up handing Ed Miliband the keys to Downing Street won’t quite do the trick. Only a third of them say they’d be swayed by such an argument, while over half say it won’t stop them plumping for Mr Farage’s outfit. That, according to Ukip’s polling, is because getting on for two thirds of those saying they will vote for the party are driven by support for its policies rather than by any desire to register a protest vote. So is Alan Bown the Grinch who’s stolen the Conservatives’ Christmas? Probably not. For one thing Tories can take comfort from other polls which are beginning to hint that, nationally, Labour’s lead may be shrinking. Of course, one or two robins don’t make a festive season. But it could be that – at long last – economic growth, along with the fact that the Opposition still seems to be taking the rap for the global economic meltdown, is beginning to work in the Government’s (or at least the Conservatives’) favour. Clearly there’s many a slip twixt GDP numbers and a genuine feelgood factor. And Labour can continue to take comfort in the fact that Ukip’s polling, like Lord Ashcroft’s before it, suggests it’s doing much better in many marginals than nationwide surveys suggest. Nevertheless, a rising tide may ultimately lift just enough boats to see the Tories end up as the largest party in 2015. For another, although there are a number of respected analysts who also make the point that Ukip attracts support from people who voted Labour or who didn’t vote at all, these latest polls still suggest the party is currently tempting more than twice as many erstwhile Tories as it is former Labour voters. Nor should anyone place too much faith in Ukip’s ability to mobilise those who were either ineligible to vote or uninterested in voting last time round. Pound to a penny, many in both groups won’t bother next time either. For yet another, eagle-eyed Tories will note from the small print in the Telegraph ads that the claims made about how they are motivated by policies, not protest or how they can’t be persuaded by the “Vote Ukip, get Miliband” line are based on questions asked in some constituencies and not others. Quite why this is isn’t made clear. And even if this weren’t the case, some purists might argue that aggregating particular constituency samples isn’t the same as conducting a properly weighted nationwide poll. They can also criticise some of the methods used as likely to boost Ukip’s support. Finally, as with all polls, Ukip’s research can only reflect, firstly, the image people want to project to whoever is asking them the question and, secondly, what people are thinking right now. It can’t discount for the fact that we all like to pretend we rationally weigh up parties’ policy offers and vote accordingly, when decades of deeper research suggests that we don’t. Even more importantly, it can’t – because none of us can – predict what we’ll be thinking, and doing, in 18 months’ time. The European elections next year may, indeed, pile the pressure on David Cameron. But they could just as easily allow us one final fling with Ukip before we settle down to the serious business of choosing who’s actually going to govern us for another five years. Mr Farage and his friends are, indeed, coming soon to a town near you – especially perhaps if you live in Thanet South, Folkestone and Hythe or Boston and Skegness. And doubtless they will end up doing Tories some damage. Whether it’ll be fatal, however, remains a moot point. This entry was posted in Uncategorized and tagged Alan Bown, Cameron, Conservatives, Polling, Tories, UKIP. Bookmark the permalink.